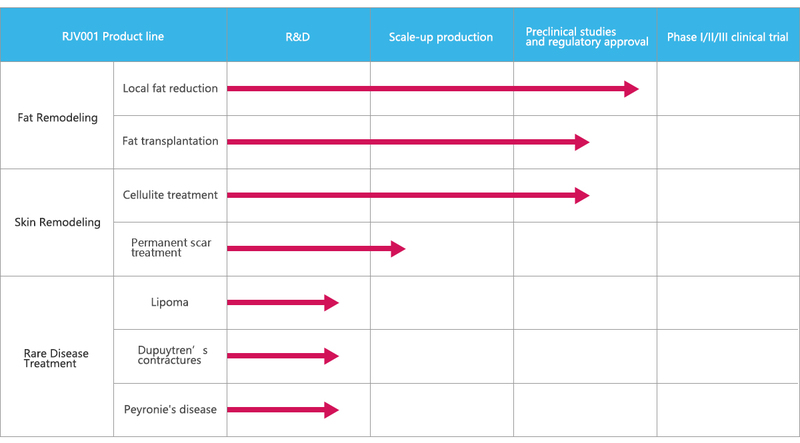 R & D Pipeline_Science and Technology_Rejuven Dermaceutical Co., Ltd.
Rejuven Dermaceutical has developed a pipeline around RJV001, a proprietary mutant collagenase targeting collagen for mild degradation in vivo. The most advanced program, RJV001 for injectable fat reduction, has completed CMC production, evaluated the drug efficacy in animal models, and passed preliminary safety evaluation. Safety and toxicology studies are ongoing. IND application is planned to be submitted in early 2019 to FDA of the US. Additionally, due to its unique activity and safety profile, RJV001 is at various stages of research and development for several other indications, as outlined in the table below.